Photo courtesy of Patti Brahim. 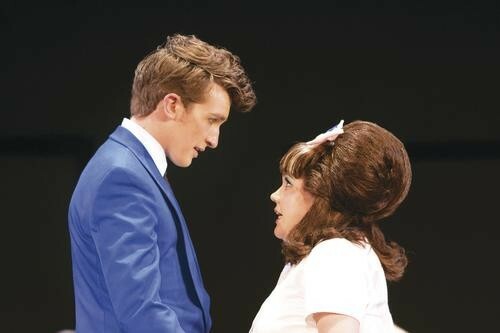 Jordan Haskins (left) and Nina Danchenko in Pittsburgh Musical Theater's Hairspray. You could say that the Pittsburgh Musical Theater's latest production, Hairspray, is about a young girl who helps break the color line in 1960s Baltimore ... but that's like saying Jack and the Beanstalk is about agrarian life in 18th-century England. Hairspray, based on the movie of the same name, is a bubblegum fairytale with no interest in presenting reality and every intention of entertaining every molecule in your body. 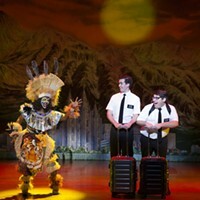 And composer Marc Shaiman and lyricists Shaiman and Scott Whitman achieve exactly that with a non-stop succession of high-energy, '60s-styled pop songs continually raising the temperature of the show. By the time they unveil their final number, "You Can't Stop the Beat," it's unlikely anyone in the audience would disagree. Former Pittsburgher Chris Saunders has returned to direct and choreograph, and the work that he's done is remarkable. 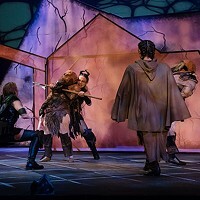 Saunders and musical director Joseph Domencic have driven this cast to the height of their collective ability while providing the rock-solid support and focus essential for such a frenetic show. Nina Danchenko absolutely couldn't be cuter or more entertaining as Tracy Turnblad, the all-singing, all-dancing, all-smiling young girl leading the charge. Michelle Coben plays the enormously quirky Penny Pingleton with her own enormously quirky comedic skill. 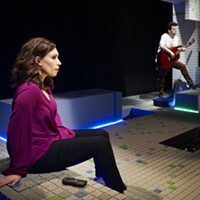 The adult roles are written for seasoned pros, and that certainly describes Jennifer M. Smith and Chris Laitta playing every single comedy beat given to them. Of course, the heart of Hairspray is the man playing the role of Tracy's mother, Edna, and Brady Patsy is a thrilling, non-stop joy in the part. When he joins forces with Scott P. Sambuco as Wilbur on "You're Timeless to Me," the effect is endearing enough to melt your heart. But wait ... that's not all. In the second act, Ja'Sonta Roberts-Deen, playing Motor Mouth, steps forward and sings the gospel-flavored "I Know Where I've Been." It may be a by-the-numbers song in a show-biz cliché moment, but Roberts-Deen with both her enormous talent and impeccable musicality brings this behemoth of a show to a dead stop. Pittsburgh Musical Theater has a big, fat, juicy hit on its hands.